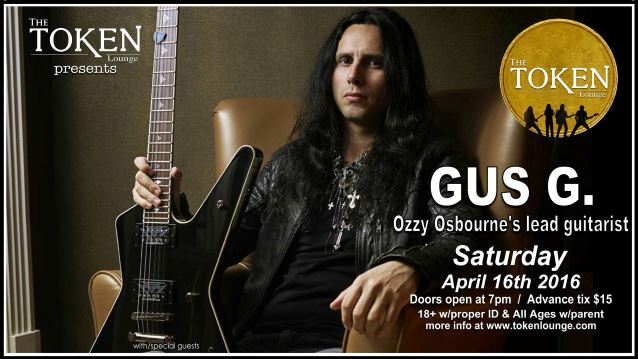 Multi-camera video footage of Greek guitar virtuoso Gus G. — well known in rock and metal circles for his work as Ozzy Osbourne's guitarist and as leader of his own band FIREWIND — performing the song "Brand New Revolution" on April 16 at the Token Lounge in Westland, Michigan can be seen below (video filmed by George Pogacich, Michelle Kolbus and Rick Arnett). Joining Gus on his current mini North American headlining tour are Jeramie Klinger (drums) and Taylor Nordberg (bass), both from THE ABSENCE, and Rob Rock of IMPELLITERI on vocals. Said the guitarist: "Rob and I have been friends for many years; we toured Japan back in 2004 and have also co-written the title track of Rob's solo album, 'Garden Of Chaos', a few years ago. I couldn't be happier that we [are] finally [touring] together again." Gus's latest solo album, "Brand New Revolution", was released in Europe in July 2015 via Century Media. The CD was made available through Century Media in Australia and South America, Dismanic/eOne in North America and King Records in Japan. The cover artwork was once again created by Gustavo Sazes, who previously worked with Gus on the guitarist's debut album, "I Am The Fire", and also took care of artwork duties by such bands as ARCH ENEMY, KAMELOT and FIREWIND.